Your breasts are made up of primarily adipose or fatty tissue. When you lose weight, your body burns excess fat for energy. This removal of fat will cause stretched skin to sag over many areas of your body, including your breasts. One of the best tried and true methods to tighten any area of the body is to improve muscle tone. Your chest is controlled by the pectoral muscles. Exercises that target this group should pull in tissue and help firm up your breasts. Lie face down on the ground. Place the palms of your hands near your shoulders and perform push-ups. Lift your body allowing your arms to support the weight until your arms extend fully. Hold for 5 seconds and return to start. Do as many repetitions as you can, working toward a goal of at least 20. 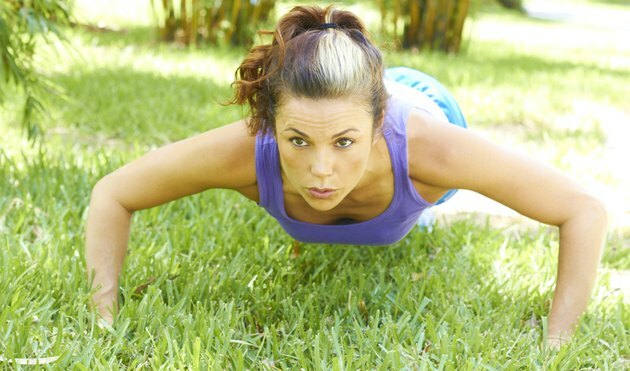 If a full body push-up is too difficult at first, push up on bent knees. Sit on a weight bench with a 5- to 10-lb. dumbbell in each hand to perform dumbbell flies. Lie back, bend your knees and place your feet flat on the bench to help support your lower back. Extend your arms and hold the weights above your chest. Keep your elbows bent and move your arms away from your chest toward the sides of your body in an arc. Push outward until your elbows are parallel with your chest. Hold for 3 seconds and return to start. Do 12 repetitions. As you grow stronger, add more weight and two more sets of repetitions. While lying on the bench with your dumbbells, perform chest presses. Start with your elbows bent, flared out to the sides and hold the weights close to your chest. Press the weight upward with both hands toward the ceiling until your arms are fully extended, then lower back down slowly. Do 12 repetitions and three sets. Increase your weight load as your pectoral muscles become stronger. All movements should be controlled and slow. Increase the weight load if you do not feel fatigue in muscles after 12 repetitions. If you feel pain in your back, rest for a few days before continuing. Talk to your doctor before beginning any fitness routine to ensure you are healthy enough to work out.